Here’s a simple exercise that can help release the tension on your back. If you have a bent or hunched back, repeated doing the exercise may help to release pressure and the stress on your back. This exercise is inexpensive and you only use your own body weight. Don’t be discouraged when at first you find that you cannot hang on the bar. Try it a few times a week- for example after a round of jogging or brisk walking, do some stretching and then do this exercise a few times. Then go for jogging or brisk walking and come back and try again. After a while, your strength will slowly built up. When I first started this exercise, at first I can’t even hold on for a few seconds- I am still not great at it but at least I can lift up my legs. 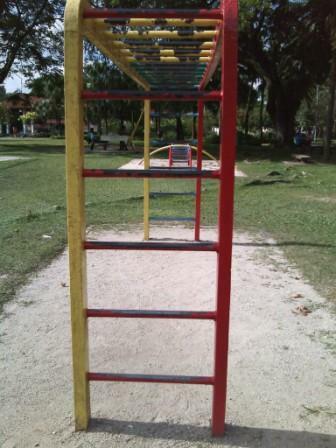 Monkey bars can be found at most children playground here and there’re really great to help built up muscles and strength using body weight. I find the exercise good to help release tension especially if we sit in the office the whole day.